The CData JDBC Drivers can be used in any environment that supports loading a JDBC Driver. 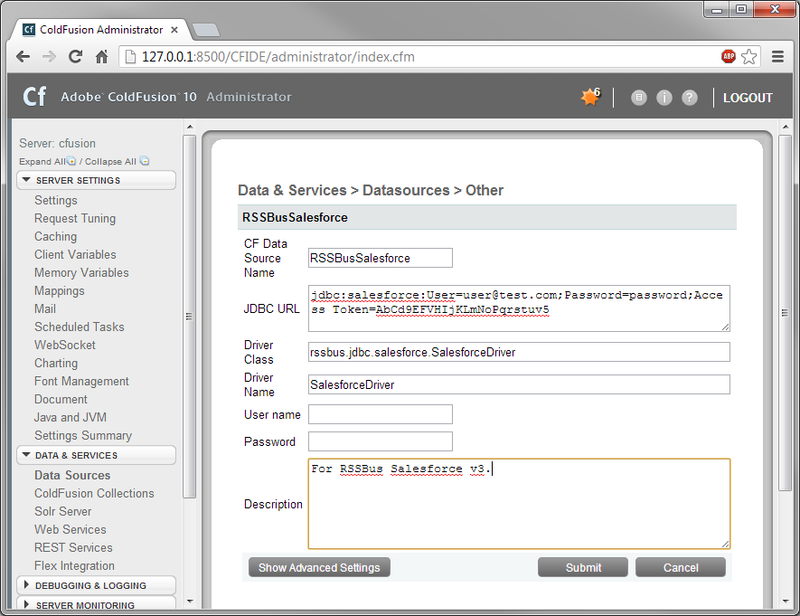 In this tutorial we will explore using the CData JDBC Driver for Salesforce from within ColdFusion. To begin, this tutorial will assume that you have already installed the CData JDBC Driver for Salesforce as well as Adobe ColdFusion v10, and that you already have a Salesforce account and security token. Add the CData JDBC Driver to ColdFusion's lib directory. Copy the JDBC Driver for Salesforce and lic file from "C:\Program Files\CData\CData JDBC Driver for Salesforce V3\lib" to "C:\ColdFusion10\cfusion\wwwroot\WEB-INF\lib". Note: If you do not copy the .lic file with the jar, you will see a licensing error that indicates you do not have a valid license installed. This is true for both the trial and full versions. 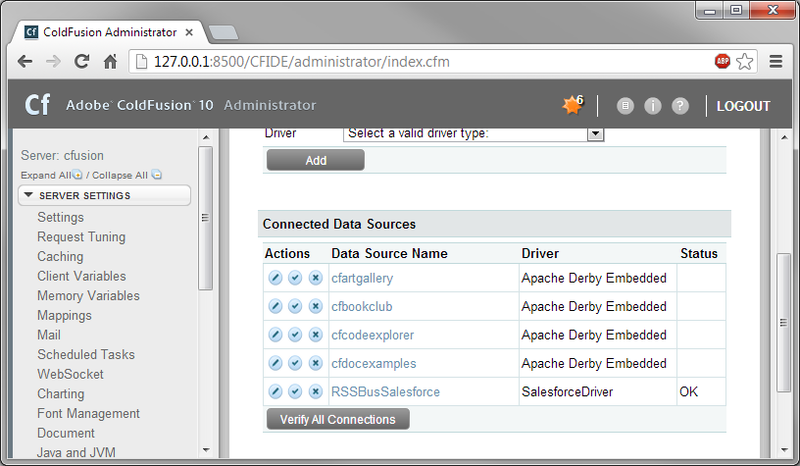 Add the CData JDBC Driver for Salesforce as a data source. 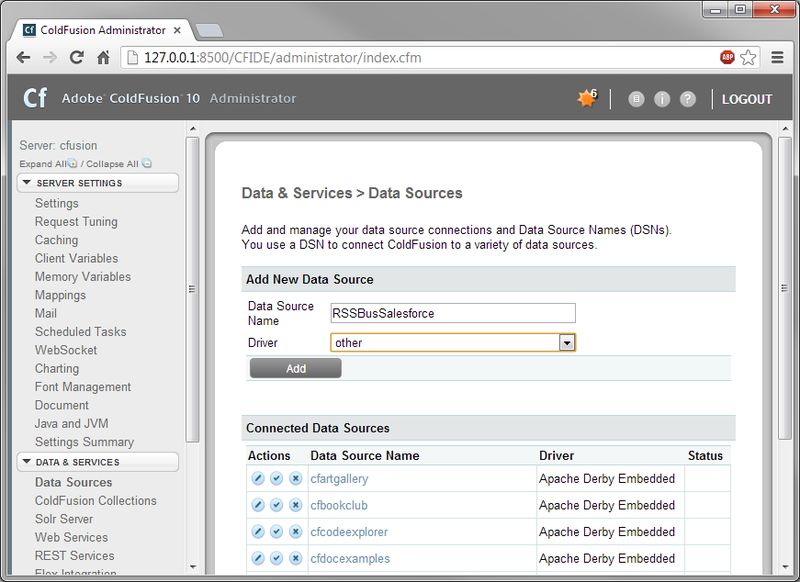 From the ColdFusion administrator interface, choose "Data Sources" from "Data & Services". Here you will want to "Add New Data Source". The data source name can be any name, provided it conforms to the ColdFusion variable naming conventions. For driver, choose "other", then click the "Add" button. 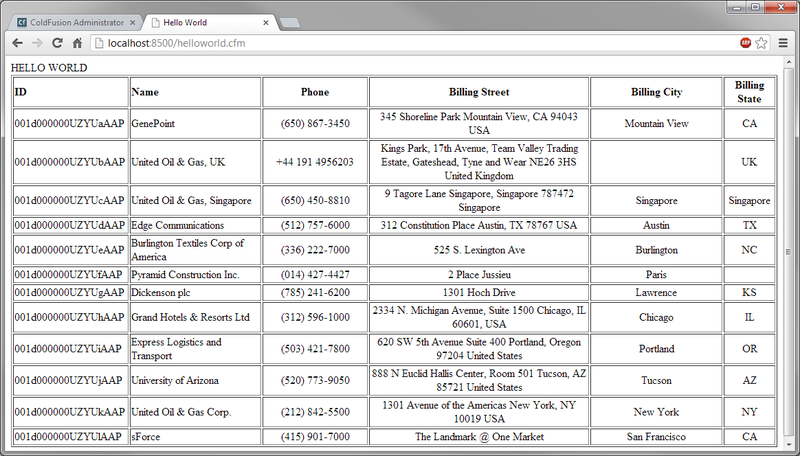 The driver name is used to recognize the data source in the ColdFusion administration console. You can now test the connection by pressing the check mark to the left of the CDataSalesforce data source you just created. The data source should report an "OK" status, and should now be ready for use. Creating the ColdFusion Markup File. Next, create a new ColdFusion Markup file (.cfm) and place it in the wwwroot ("C:\ColdFusion10\cfusion\wwwroot") directory for ColdFusion. If you have any questions, comments, or feedback regarding this tutorial, please contact us at support@cdata.com.